Future progressive definition: The future progressive tense is a verb tense that indicates a continuing action that will occur at some point in the future. 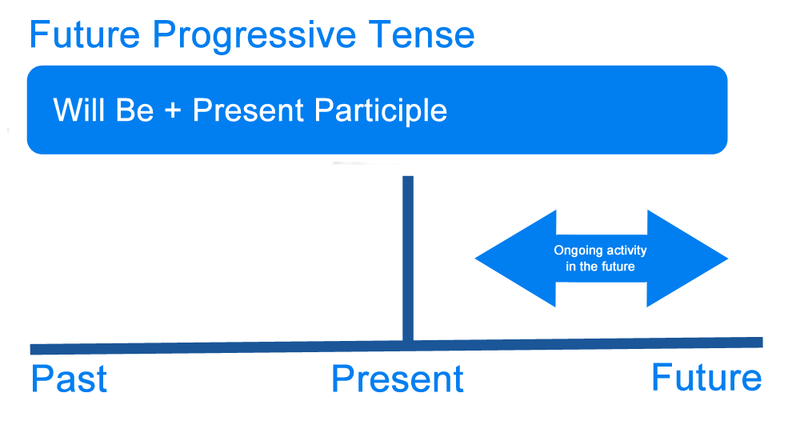 What is the Future Progressive Tense? The future progressive tense is an English verb tense. It indicates an action that will occur over a period of time at some point in the future. The future progressive expresses events that will last for a duration of time at some point in the future. It is also called the future continuous tense. The future progressive tense is also used in the future perfect progressive. I will be going to university next year. You will be calling the station at noon. The future progressive follows a standard formula. It is created with a future “to be” verb conjugation and the present participle of a verb (with an –ing ending). All subjects, singular or plural, take the same verb conjugation in the future progressive tense. Sentence: He will be attending the service. Sentence: They will be applying for the position. This refers to actions that will occur at some point in the future. These actions will last for a period (duration) of time. They will be finishing school soon. We will be living in San Francisco. This refers to actions that will NOT occur at some point in the future. He will not be graduating. You will not be going to the dance. They will not be eating with us. We will not be arriving on time. This refers to actions that may or may not be occurring over a period of time in the future. Will + subject + be + present participle ? Define future progressive tense: the definition of future progressive tense is the verb tense used to express ongoing or continuing future actions. is used to express future actions that will occur over a period of time. can also be negative or interrogative. 1 What is the Future Progressive Tense?